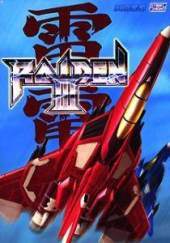 This is the follow-up to the early 90's shoot 'em-ups Raiden and Raiden II. Once again you control the Raiden "Fighting Thunder ME-02" trying to fend off the attack of the alien invaders. There are in total 7 levels, the first three set on Earth and the last three in space. This is a vertically scrolling shoot 'em-up which (as many other vertically scrolling shooters do) offers the option to either play the game in "yoko" or "tate" screen flipping modes depending on whether your tv is placed on its side or not. In arcades, it was the first game to use the "Taito Type X arcade system"-board. It implements a 3D scrolling system permitting the scenery to move in three dimensions: climbing, descending, vertically moving. It's set in a universe different from all previous games and updated with a new look and feel. New concepts are introduced, which includes a "new 3D scrolling system" that involves the camera pointing down normal to the player while the scenery moves in three dimensions: climbing, descending, and sometimes moving vertically. The blue Laser concept is more like a beam, instead of the ones seen in prior instalments. Players once again take control of the famous Raiden Supersonic Attack Fighter, red for player 1 and blue for player 2 as usual; there are no selectable ships. Two player mode is enhanced by an exclusive new attack: a beam that is usable whenever one player lines up in front of the other. In Double play mode, both players share the live and bomb stocks, and without continue. Windows version added following features: boss rush mode, score attack mode, stage select, adjustable difficulty levels are gained by how long the game is played, and free play is unlocked by completing all stages. Adjustable display modes - window mode, full screen mode, adjustable zoom ratios (x0.5, x1.0, x1.5, x2.0). The Windows port published by Soft-World International corporation includes an English translation of the text originally written in Japanese.